With a little more than a month of his term as Philippine President, Benigno Aquino III signs Republic Act No. 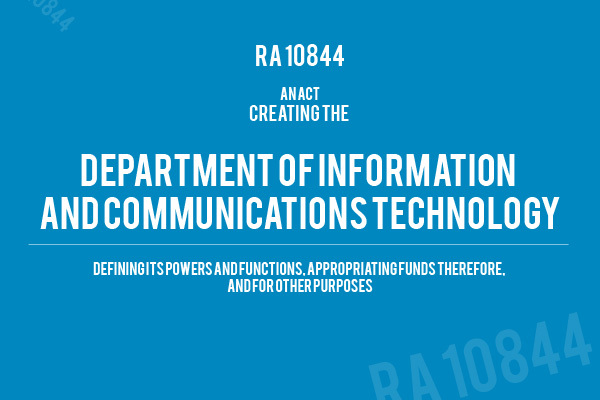 10844 that sets to create a Department of Information and Communications Technology (DICT). Concerns about ICT in the country was previously handled by the Department of Transportation and Communications (DOTC). The law aims to give ICT its proper attention by having a separate department with its own competent Secretary and Undersecretaries. Some of the goals of RA 10844 are to provide quality and affordable ICT services to every Filipino. It also mandates that ICT systems, infrastructures and resources be improved. Meanwhile, the DOTC will be renamed to merely Department of Transportation. Some offices such as the Information and Communications Technology Office and National Computer Office will be transferred under the new DICT.